My goal in the art room is to create lessons which allow all students to successfully accomplish the goals at their own level and to help students continually push themselves to learn more and expand their knowledge of the materials, themselves and the world around them. 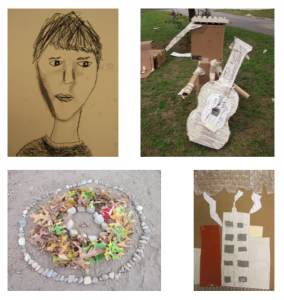 All lessons are developed to meet the standards set in the Massachusetts Art Frameworks (standard 1-5/standard 6-10) and Concord Public Schools Art Curriculum Goals. I strive to make art an enjoyable experience for all my students and to create lessons they can connect to in a variety of ways because I believe this is the best way to get the the most out of our students. My most rewarding moments are when I hear students excited about the new color they made or the problem they solved. My hope is that this website will help you, as parents, foster that excitement and learning at home. Go through the website with your children or preview it before so that you can have meaningful converstaions about the work they are bringing home and will understand the underlying objectives of the work you are seeing. Remember, there are no wrong answers in the art room only different interpretations and that is what makes art great! Have fun and Thanks for taking interest in cultivating the arts at home. *Some lessons may be completed out of order, changed, omitted or added throughout the year in order to better meet the needs of students. I will do my best to keep the website up to date.